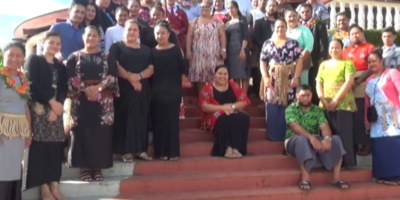 A special program was conducted last Friday evening to mark the 2 years anniversary of the Tonga Youth Employment and Entrepreneurship (TYEE). Speaking during the program, the Guest of Honor, Hon. Fatafehi o Lapaha Filipe praised all the good and hard work of the NGO in order to ensure a better future for the youth of Tonga. Meanwhile Sela Bloomfield, a Board Member of TYEE spoke of the various services provided by the Organization. The celebration was marked with a fashion show highlighting various industries and business houses who employs the young men and women of the organization. Included in the occasion was a cake ceremony led by Hon. Fatafehi ‘o Lahapa Filipe.